This year on Star Salvation, Geoffrey Zakarian and Damaris Phillips are acting as mentors to the eliminated contestants who are trying to earn their way back onto the show. Also, this season, two fan favorites from previous seasons were brought back to compete, who were already revealed as Chad Rosenthal and Martie Duncan. 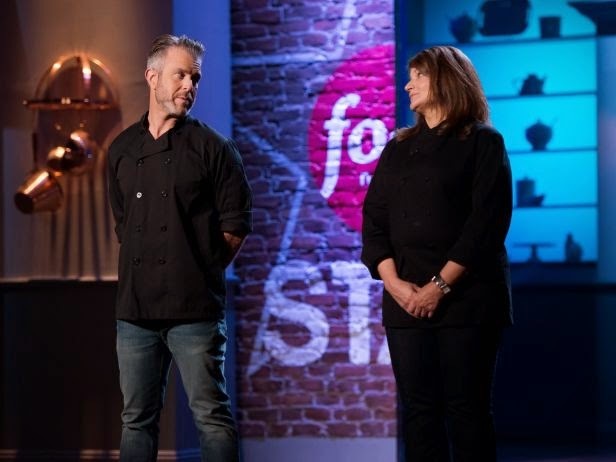 In this episode of Star Salvation, Chad and Martie competed against Donna Sonkin Shaw, who was the first contestant eliminated from season 10 of Food Network Star. The videos (2 parts) of the first Star Salvation episode and the contestant eliminated is after the break. Martie Duncan was the first one declared safe. That meant Chad or Donna would be eliminated from Star Salvation. The judges decided to eliminate Donna and she will not be the next Food Network Star. Glad to see Donna go...she was annoying. The Cowboy Chef is somewhat likeable, but he needs to get rid of that stupid costume. I can neither watch him nor take him seriously in that moronic getup. Not sad to see Donna eliminated for good. She was just grating. I have to say, it's nice to see the channel actually airing these late at night so I don't have to watch online! IMHO, they just haven't found that right person yet. It's hard to find someone who is authoritative, genuine and not preachy, i guess. If they did though, I think s/he would all but be ushered into the finale. I'd have paid real money to have Ippy back. It's not the POV; it's how it's delivered. The minute she started talking about Vitamin K and lycopene, she took the excitement out of her food. There's a difference between saying "Tomatoes are full of lycopene, which is good for eye health" and saying "Tomatoes are not only tasty, but—surprise!—they're good for your vision." Although I agree that her delivery sucked, I have to wonder whether her weight coupled with her POV had an influence. After all, every other "healthy food" chef has been either very slim or very toned. There's a question as to whether an audience would be inspired by a somewhat larger gal preaching healthy eating. This group seems more, uh, "tv ready" than in the past, so I wouldn't be surprised if appearance is playing a larger role in general this season. I think the real problem is that the "healthy food" contestants tend to be preachy. Viewers don't want to be hit over the head with a POV; rather, they need to be excited about it if they're going to buy in. Bobby Deen's Not My Mama's Meals is a good example of how to do a healthy food show, especially since it plays on traditionally indulgent foods and provides variations that still seem like indulgences even though the fat and calories are reduced. As is usually the case. I'm not a fan of any of the Deens but agree he has the right approach. 'The Kitchen' Co-Hosts To Compete On Chopped? Food Network Gossip is in no way affiliated with the Food Network or any of its employees. Simple theme. Powered by Blogger.